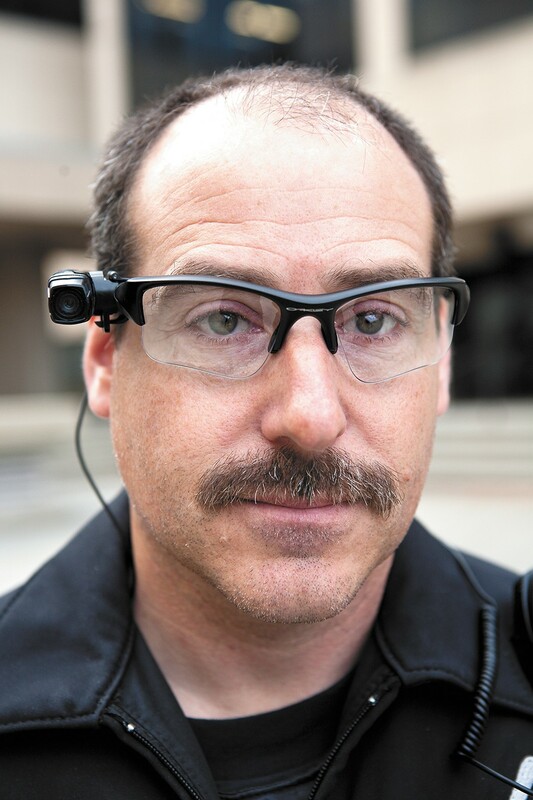 Spokane police tested a glasses-mounted camera before later selecting a simpler chest-mounted model. As the Spokane Police Department prepares to roll out officer-mounted body cameras in the coming months, privacy advocates with the ACLU of Washington call the department's proposed camera-use policies "disappointing" after language was dropped that reinforced what officers must record and outlined privacy protections. 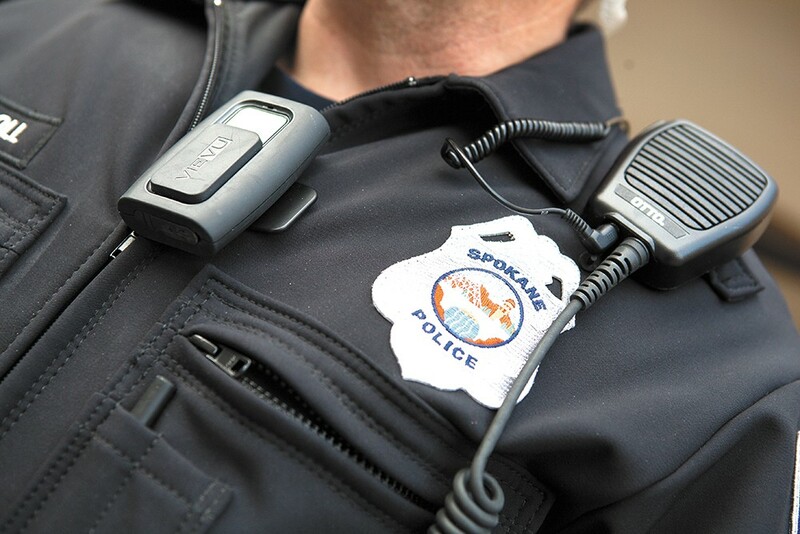 Jamela Debelak, the technology and liberty director at ACLU of Washington, sent a letter to the Spokane Police last week, expressing several concerns with the proposed draft policy on body cameras. Debelak argues multiple sections were removed that helped ensure the cameras would monitor officer conduct without undermining the rights of innocent citizens. She says the pared-down policy weakens officer oversight while increasing the risk of unnecessary police surveillance. "These omissions severely limit the cameras' value as an accountability tool," Debelak writes, adding, "If accountability is not the fundamental purpose of these cameras, then they serve primarily as evidence-gathering tools that can capture large quantities of information on innocent people." Spokane police tried the VieVu camera before settling on a similar model from Taser. In recent years, police accountability advocates have called for body cameras to improve the Spokane department's transparency. Police officials have publicly embraced the technology, suggesting most footage will prove officers to be professional and courteous. Officers are expected to begin wearing cameras regularly by September. Throughout the public debate, SPD officials have emphasized the importance of carefully crafting a usage policy that protects both citizens and officers. The ACLU's letter, accompanied by a 12-page draft of policy changes, offers the first public look at how those policies have come together — defining when officers may record footage, who can access it and how it may be used. "The SPD body camera policy is not final," SPD spokeswoman Monique Cotton clarifies via email. "We welcome and appreciate feedback as we work to develop the best possible policy for both the public and the department." Many law enforcement agencies across the country have adopted body cameras in recent years as both a check against officer misconduct and insurance against false accusations. Footage can also serve an important role as evidence in criminal or civil cases. Accountability advocates cite police studies showing body cameras can reduce the amount of force a department uses by up to 60 percent. Law enforcement leaders say civilians also tend to act more politely toward officers when they know they're being recorded. "Body cameras are going to be absolutely wonderful," Spokane Police Chief Frank Straub says. "I can't wait for body cameras." The Spokane City Council first approved approximately $600,000 in funding for cameras in April of 2013. Police officials tested several models before purchasing 220 pager-sized, chest-worn Taser Axon Body cameras earlier this year. The department also signed a three-year contract with Taser's Evidence.com video cloud-based storage program to hold and maintain the footage. The proposed SPD camera rules, Policy 703, states "most" contacts between patrol officers and citizens "shall" be recorded with body cameras for use in administrative reviews of officer performance, incident documentation or for training purposes. Most video also will qualify for release under public records law. The policy quickly notes any video may have limitations on angle and audio, so it should only serve as a part of the record alongside reports, witness statements and forensic evidence. SPD officers will be required to activate their cameras at the outset of each citizen interaction and must announce on camera that the encounter is being recorded, according to the draft policy. Officers should let the camera run until each call is complete, then download the footage into a tamper-resistant storage database at the end of their shifts. The policy states any footage involving a flagged "incident identified" will be kept until any associated case is resolved. Such footage is defined as "a unique or unusual incident or action from which litigation or criminal prosecution is expected or likely to result," including arrests, uses of force, scene investigations or interactions tied to a conduct complaint. All other footage, according to the policy, would be deleted after 30 days. By and large, the ACLU has supported the national proliferation of body cameras as a valuable tool for police oversight, but advocates have warned of the need for clear policies against misuse. Debelak takes issue with several sections cut from the most recent SPD policy, including a section specifically defining when officers must record certain interactions. "Rather, police officers are free to turn the cameras on and off at their discretion," she writes. National ACLU recommendations for camera use include clear requirements for when cameras must record. Advocates acknowledge officers should not have to record their every movement and casual conversation, but when on patrol they should record as much as possible. The ACLU suggests failure to do so should result in disciplinary ramifications and the potential impeachment of evidence. Other removed policy sections gave examples of unauthorized camera use and outlined how Internal Affairs investigators could access footage. Debelak recommends an additional section that would prevent police from using existing footage to establish any new criminal leads, which might allow an officer to record a protest crowd and then go back to look for any unlawful behavior. "The Department has an opportunity to be a leader for the state by creating strong, privacy-protecting policies for body cameras," she writes. "Unfortunately, [this policy] does not accomplish this." Police officials have noted they proactively asked the ACLU to review the policy. Cotton confirms that SPD officials have received the ACLU's letter, saying the department appreciates all feedback as it continues to develop a final policy for the cameras. The Spokane Office of Police Ombudsman and the legal nonprofit Center for Justice both report they have not been provided copies of the draft policies, but they hoped the department would be able to address at least some of the ACLU's concerns about privacy and officer accountability.